Two weeks ago I offered a Small Business giveaway to develop processes and best practices for promoting small businesses. Not surprisingly, some of the bloggers who regularly read GrowMap were far more excited about the opportunity to work with me – especially Kelli from 3BoysandaDog – who you may know from her exceptional series of guest posts on How to Score a Mommy Blogger. I made a command decision to have TWO giveaways so I can document the processes involved in promoting a small business and growing blogs. Although there is some overlap in strategies, the priorities and processes are different and the case studies and results will be of interest to two different audiences. Kelli being the generous person she is agreed to identify and collaborate with four other bloggers in the same niche as her new giveaway and deals blog so that we can implement my new five blog collaboration plan. I’ll be writing about what we’re doing and putting together other five blog groups so you may want to tune in. Even if you don’t want to be in a group you can use what I share to grow your own blog traffic and visibility. 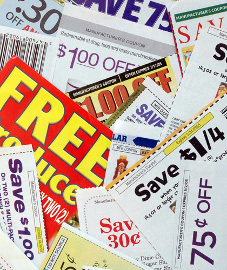 How to use coupons, frugal living and eating well on a budget. They call themselves Savvy Frugal Bloggers. and eating well on a budget? I’m publishing a post tomorrow that lays out what actions we’ve done as a group so far and will publish detailed how-to posts so any bloggers who are interested can benefit from what I’m sharing with them. I shared this post from @AskKim on Where To Start When There Are So Many Things to Learn, Do, Apply and Study with the group to keep them from feeling overwhelmed. It contains important tips for every blogger or business owner. I recommend saving it and referring to it whenever the stress of knowing there is too much to do hits. Price and Quality are the key factors that help determine which sites should prevail in the long run. I had been a long-term fan of Amazon India and they’re quite popular over here when it comes to buying electronics. But when it comes to flight and hotel booking, I have to rely on home-grown websites. here is a neat coupon blog, think they use wordpress http://www.mefindcoupon.com anyone know where I can find. Great project. I will search for your posts about the progress. I’ve never even thought of creating a coupon blog. Honestly, I didn’t really think such things existed. I may have to look into this more. Wow, what an amazing opportunity! I’m sorry that I missed the giveaway but I’ll be excited to tune in to read up on the process! You’ve got quite a big project there. How did it come to life? How did you get the idea for it, it must be the result of a certain experience. I’ve been watching how bloggers grow their traffic and influence and am applying what I’ve seen to create a process to benefit many more collaborations of bloggers. Every blogger can get a head start by seeking out the best other bloggers in their niches, commenting in their blogs, and sharing their best content. That’s a wonderful solution! Instead of competing with the top ‘dawgs’ in your domain is for the best to ask for a collaboration. And the resolve you’ve found also keeps their ego satisfied: collaboration with other bloggers and not through guest posts, at the same time ‘keeping their blog for themselves’. This sounds good! Judging your post about the case study as well as the chosen blogger, I am definitely sure that this will turn out great! The question should be…who isn’t interested in saving money? I look forward to taking a closer look at all of these blogs and to your documentation of this entire process. Thanks for helping those small business owners. They have been the back bone of our economy during last recession. Overall, it’s great! It is so great to see positive views despite the economic problem we are facing. Indeed small business owners contribute so much in the improvement of the economy. Thank you. I do appreciate it. Next time I will definitely ask 🙂 Also thank you for your kind wishes on the project. These blog groups represent an interesting concept, i might take you up on your offer when you’ll be putting them together. Gail, you’re one of the most generous people I’ve ever come across on line. This case study will definitely be great for everyone involved and for folks following along. I’ll be sitting up and taking notes! Personally, I really appreciate the fact that you are helping small business owners. When you are passionate about helping others, they will feel it and most, maybe not all of them, but most people will be genuinely grateful for the help and they will try to return the favor. Small business owners are the ones who most need what I know and have the least resources to acquire it so they are my priority. I am hoping my Small Business Internet Marketing Starter Packages take off because they provide free advertising online indefinitely. This sounds like it’s going to be a great learning tool Gail. I look forward to following along and seeing how it all unfolds! Thank you Gail! I am learning a ton and thankful for your service! Thanks so much, Gail! We are learning so much from this process! What we’re doing will be SO valuable for many other bloggers. Thank you and the others for being willing to invest the time to make a difference for yourselves and all those who come after you.